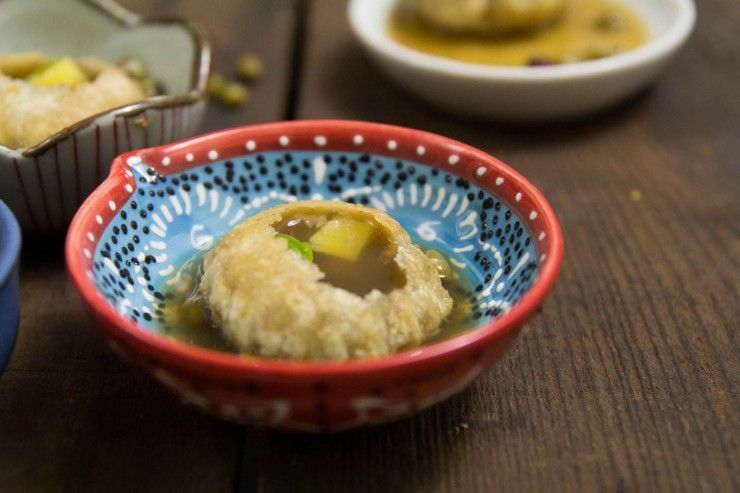 Pani Puri and our Anniversary Post Giveaway! Puja and I got married three years ago, on June 4th, in a mostly Indian-style wedding. For the ceremony we dressed in Indian garb. Puja had mendhi (henna) on her hands and feet and I rode in on a horse with a baraat– a groom’s procession led by a dhol drummer. It was so much fun.
. We use them for making everything from beans and lentils to shaaks such as undhiyu. A pressure cooker turns an all day cooking job into thirty minutes or so. To be honest, after two years of hard work, I still want so much more from this blog. We have learned so much in the process of creating it. It has given us so much practice that everything has improved, from the photography, to the site design and writing. But we have so many more ideas that just haven’t made it to the page yet. The biggest challenge for us is finding the time. I’m sure other bloggers will identify with that! Every post takes several hours, from coming up with a recipe idea, to preparing it, correcting it if need be, then photographing it which usually takes an hour if not more to get things just right, then editing the photos on the computer and doing the write-up and editing that. So often, Puja is tired from work, or I’m tired from work, and it can be such a challenge to come together and get to work on the ideas we’ve been hashing out. When we conceived of Indiaphile, it wasn’t even really a food blog. The food was just going to be a part of it. But Puja’s passion quickly steered us in that direction. Our original mission was to share our experience with her culture, and our observations and discussions. Puja and I often get into these long talks about what Indian culture is like. It always starts with her explaining some small thing to me, and then at some point I make an observation that is new to her because I’m looking at it as an outsider from the culture or I am relating it to something in my experience. Indiaphile has opened up opportunities that weren’t on our minds when we started. We never expected Puja to appear on the radio, or TV or San Diego’s top regional magazines. But it happened. We’ve met so many cool people along the way, people who are interested in what we are doing, and people with their own interesting blogs in the area. After two years, there are so many ideas we’ve been floating out there that still get us excited. 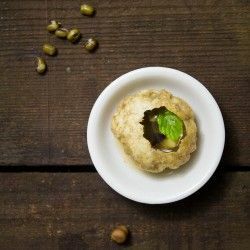 For our anniversary post this year we decided to do Pani Puri. 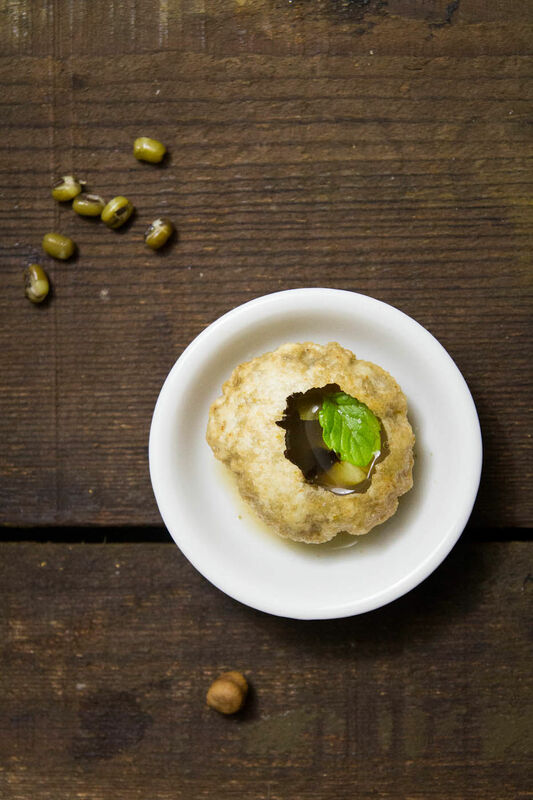 Pani Puri is one of Puja’s favorite street foods. And that’s saying a lot, because she loves street food. 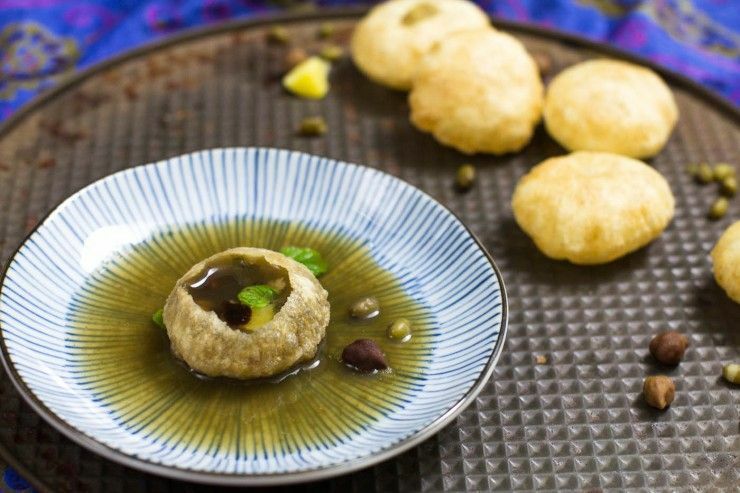 Pani Puri makes a great presentation and is just plain fun to eat. 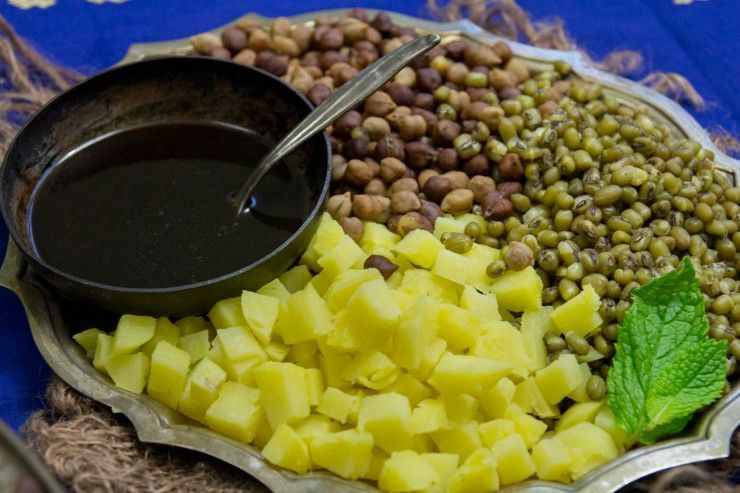 It is made from some very basic ingredients, garbanzo beans (chana), moong beans and potato. You can substitute other beans that you have on hand as well. You place these in a puri (a crunchy shell) and add chutney and “pani.” Pani means water, but in this case, it is a flavored water. When you eat it, you stick the whole puri in your mouth. What you get is a wonderful assortment of flavors and textures. 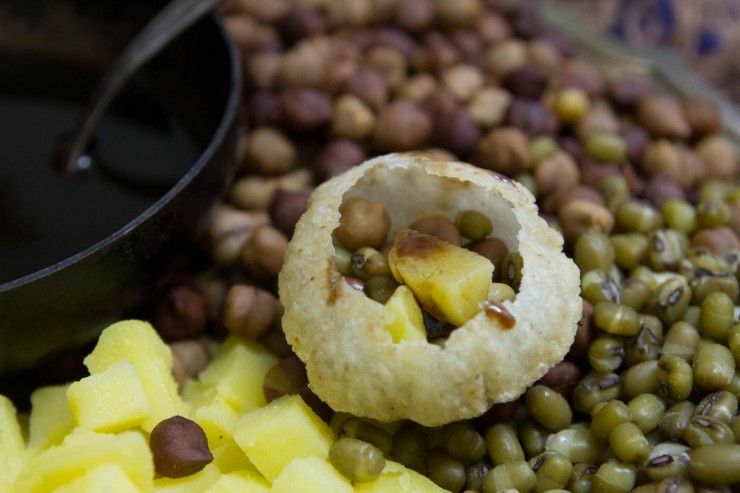 The puri crunches and collapses in your mouth, releasing the pani as you bite into the soft potato and beans. What you taste is an explosion of sweet, tart, spicy and cool mint flavors. 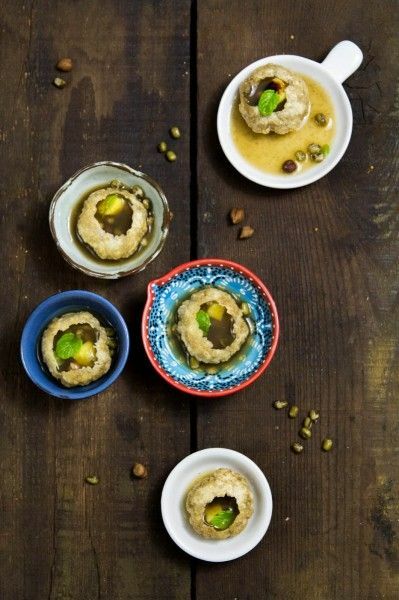 This version of pani puri is what my mother-in-law makes. It’s a little different from the Bombay street version that uses a hot pea stew instead of chana and moong. To enter in the raffle for the Pressure Cooker, make sure to like us on Facebook. For a second chance to enter, you can sign up for our emails. Once you have done that, make sure to leave a comment on this post and let us know what you did! (You can enter up to two times by doing both things). The deadline to enter is July 5th. Break the shells by crushing the tops with your finger or tapping it with a knife or spoon. Be careful not to crack the side or bottom of the shell as you do this. Add an equal amount of garbanzo beans, moong beans and potato to each one to fill. Top with a few drops of tamarind chutney. Fill the shell completely with pani puri pani and consume immediately. You can prepare each shell ahead of time, but don’t add the pani until the last second before eating. 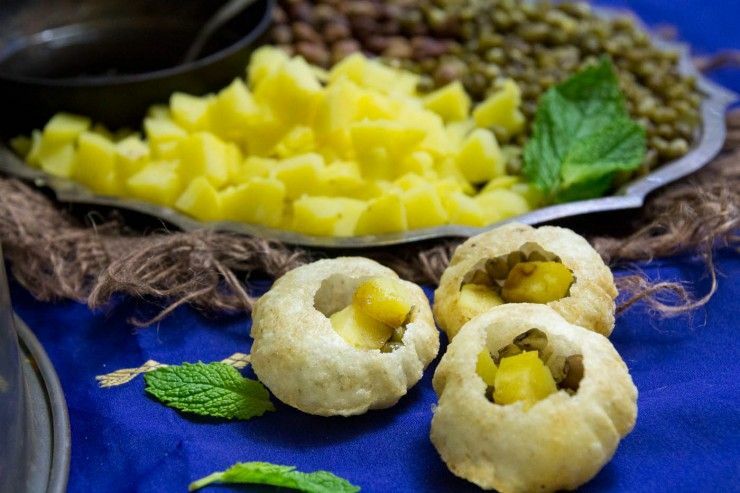 Pani puri shells are easily available at Indian stores. 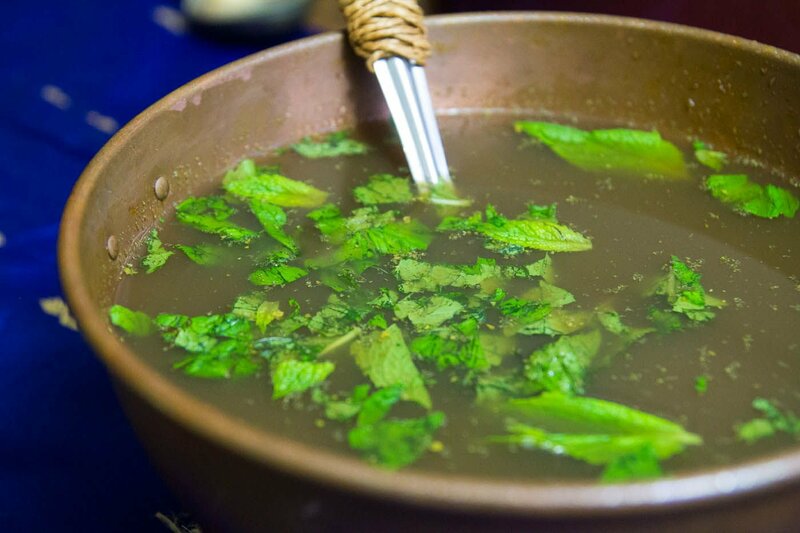 Put 1/2 cup water with mint leaves, chili and tamarind concentrate into a blender, and blend thoroughly. Add the rest of the ingredients and blend to combine. Chicken Tikka Masala and First Anniversary Giveaway! 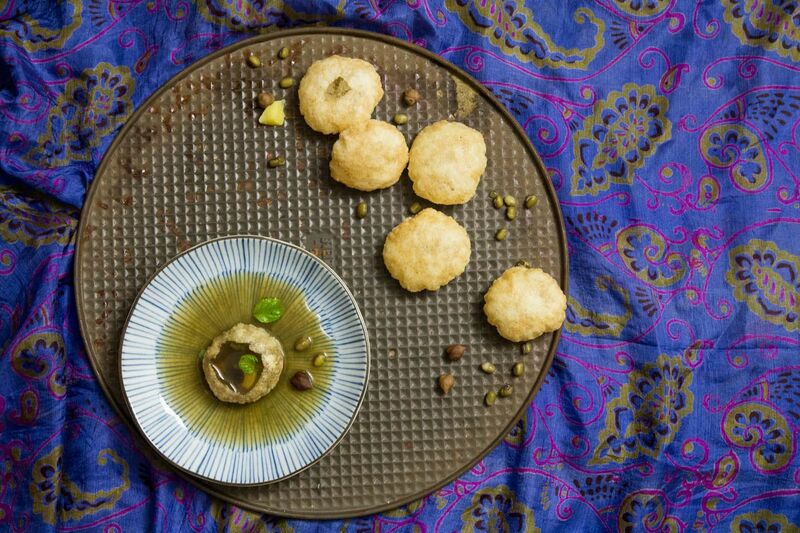 Comments on "Pani Puri and our Anniversary Post Giveaway!" I like you on Facebook! Thank you for the opportunity to win and for your wonderful blog! I have been enjoying your recipe posts on Facebook. I have always appreciated Indian cooking and over the last several years have been able to acquire the most impressive collection of spices. I have even planted a mint patch in my yard! I love all the flavors, and am no shrinking violet when it comes to HOT spices and heat. I love everything about it. Keep up the great work with the blog and recipe sharing.! Thank you for giving us a chance to win a pressure cooker. Signed up for email subscription. Was already a fan of yours on Facebook. Belated Anniversary wishes to both of you. Love the way Panipuri looks. I am already a fan by e-mail, but I have liked you on FB too! Thanks for the opportunity...would love the pressure cooker! I love your blog. The effort you put into each post is evident. This giveaway is exciting! I have subscribed to your blog posts via email. Thanks! Congrats on your two year blogiversary! The photos look awesome - it looks like a little crunchy pocket of love. I like your Facebook page already. Happy anniversary and thank you for sharing your story with us!